The Mother trilogy is one of Nintendo’s famous trilogies in Japan. Created by the famous Shigesato Itoi, the Mother series was successful in the Land of the Rising Sun. Back in 1989/1990, Nintendo of America wanted to bring Mother over to the West as Earth Bound. They began the localization process and had the game ready to go for production only to make a business decision to cancel it due to the Role-Playing Game being a niche genre in the West and to focus on the upcoming Super Nintendo. It sat in the vault for 26 years until this year when Shigesato Itoi announced the release of Mother as Earthbound Beginnings on the Wii U Virtual Console at the 2015 Nintendo World Championships. For the first time, everyone around the world can play an official release of the classic 1989 Famicom Role Playing Game. Is it worth going around the world or should you send it back home? 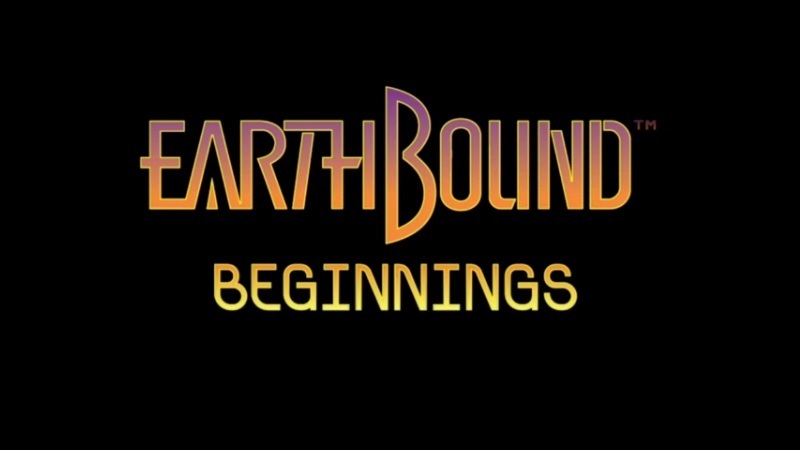 The game itself is not actually titled Earthbound Beginnings, it is titled Earth Bound (two words). Nintendo labeled it as Earthbound Beginnings so consumers would not confuse it with Earthbound on the Super Nintendo. This was a good move on Nintendo’s part so no one would accidentally purchase Earthbound Beginnings thinking it was the Super Nintendo classic. After naming your four characters and typing in your favorite food, the adventure begins. Earthbound Beginnings takes place in what is supposed to be modern day America. There is no medieval setting, no swords, no knights, and no princesses. Instead, we have average citizens, hippies, baseball bats, frying pans, guns, hospitals, department stores, doctors, healers, and other modern comforts familiar to us. The character sprites look similar to the iconic characters of Peanuts. I have no doubt in my mind it was an intentional design choice when the game was being developed. George and Maria one day disappeared after a mysterious shadow covered their home. 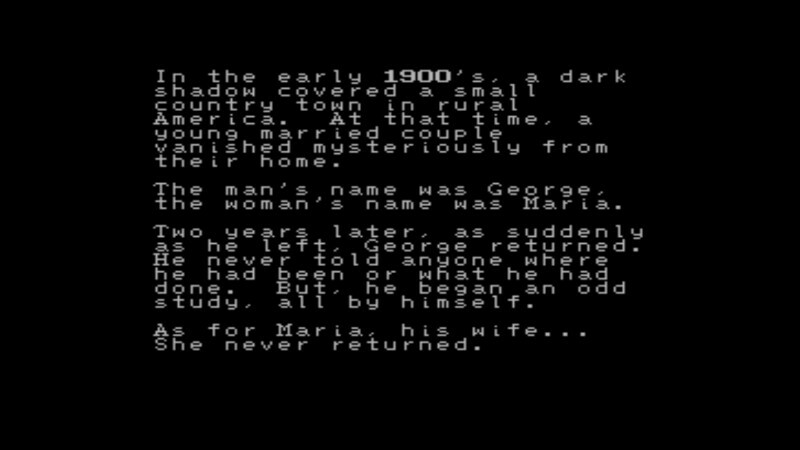 Two year later, George returns, but Maria never comes back. He spent the rest of his life studying PSI. Their descendent, Ninten, must go on a quest to save the world from some mysterious phenomenon happening across the land. He is eventually joined by Ana, Lloyd (or Loid in the Japanese version), and Teddy as they try to save the world from a grand-scale invasion. Ninten looks on to a dreaded place in the distance. Earthbound Beginnings is a traditional turn-based role playing game. Inspired by the Dragon Quest series, Ninten and his party must explore the land and visit towns, complete quests, fight enemies, and collect the eight melodies scattered throughout the land to stop an ongoing invasion by the Starmen. The story is darker than the sequel following it. Visually, the game is a bit too simplistic and is bare at times. Sure, there are details on the buildings, but the swamps, fields, and snowy terrain are plain. It’s not the worst visuals from a Famicom game released in 1989, but games such as Super Mario Bros. 3 and Mega Man had better graphics and came out earlier. Earthbound Beginnings lets players know one thing from the beginning. This is a difficult RPG to master. With a high difficulty, grinding is going to be important. 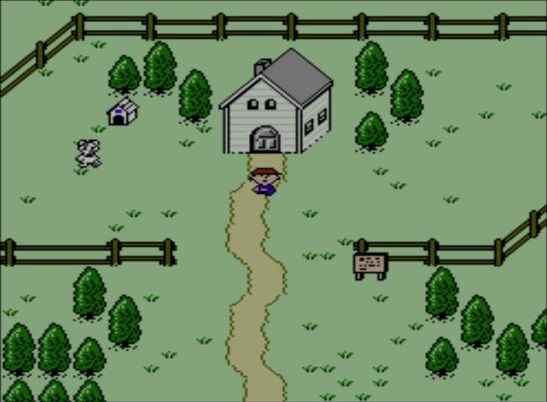 Ninten is unable to walk a few steps from his house at the start until he gains a few levels. Some enemies can knock out Ninten and his party if they are not adequately leveled. As the party walks across the land, there is a chance they could run into an enemy. Unfortunately, the random encounter rate is all over the place. Sometimes, I am able to walk several feet without a single encounter and at other times, I can only take one to two steps before an enemy attacks me. Towns and certain landmarks will be free of random encounters so Ninten and his party can rest up, get healed, and buy items at the department store or restaurant. When enemies are defeated, some money will be deposited into an account from Ninten’s Dad. Accessing the money is as simple as using the cash card and withdrawing money. Unwanted money can also be deposited at an ATM. The wise strategy is to only carry the amount of money you need. Item management is very important, especially during the first third of the game. Unwanted items can be sold or dropped. Ninten can talk to his sister at his home and have her store items for the party. If the party is KO’d, they can continue at the cost of all your PSI and half of your money. With this mechanic, players never need to fear a Game Over screen. PSI powers are not strictly learned at specific levels. 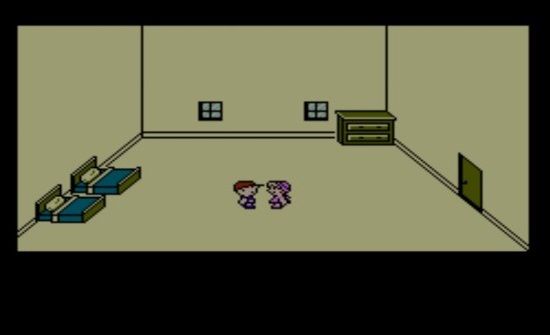 Earthbound Beginnings has Ninten and Ana learn new PSI moves as the game progresses. Learning new PSI moves happens at random, but the chances increase as they level up. Lloyd and Teddy never learn PSI moves. The party can equip up to four items at one time. They can equip a weapon, a pendant, a ring and a coin. When a new party member joins you, it is important to immediately purchase equipment and to take some time to adequately level them up, especially since 3 out of the 4 people who join your party start at level 1. The game has a max of 3 party members at one time. The soundtrack is fantastic, especially for a game on the Famicom. Anyone who is familiar with the series will recognize the iconic tunes Pollyanna, Youngtown, and Snowman. The game contains its own unique compositions such as Bein’ friends, Youngtown, the three battle themes, and of course, the Eight Melodies. The music takes advantage of the Famicom’s limitations and creates the appropriate atmosphere for each area. The iconic moment of the game. Magicant plays a large role in the game. The area is a mysterious land under the rule of Queen Mary. Queen Mary tasks Ninten to find the eight melodies. This is where you can buy the best items and defensive equipment. This is also a place full of enemies for level grinding weaker party members. After visiting Magicant for the first time, Ninten receives the Onyx Hook, an item the party can use to instantly transport to Magicant. 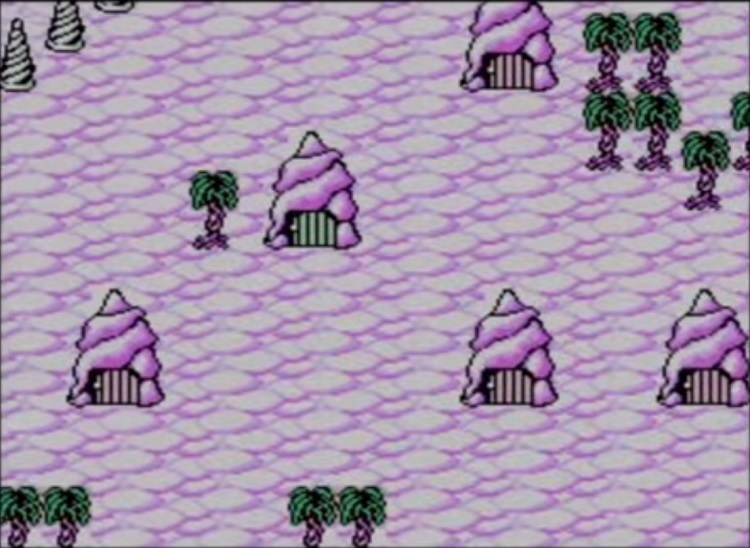 The Onyx Hook becomes a bailout if you are in a tough situation as it lets you heal up for free, but in exchange, you have to go through the dungeon to exit out each time until you learn teleportation, a PSI power Ninten and his party do not learn until two-thirds of the game is done. The localization of Earthbound Beginnings was done back in 1990. The game has the same quirky charm and humor used in the sequels. There were some moments that made me laugh out loud. When the game was localized, the developers made sure there were plenty of hints in the game. The NPCs are not too cryptic and do a good job giving you clues to your next objective. If that is not enough, there is a hint lady who will give you a hint for $1000. If you refuse the offer, the hint lady is gone forever. Some changes were made to the localization process. 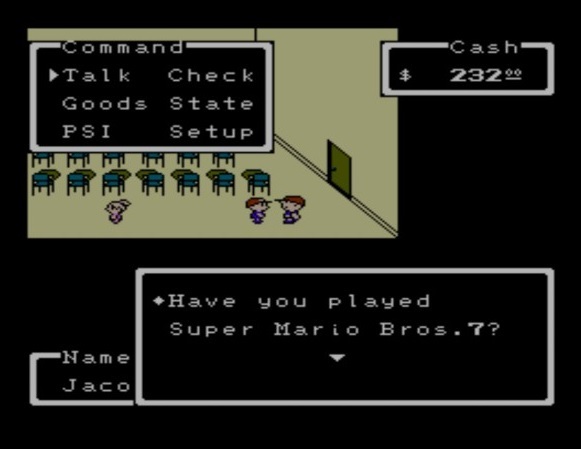 Some sprites were changed to conform to Nintendo of America’s policies at the time. Sorry kids, the crow is not going to be smoking cigarettes. 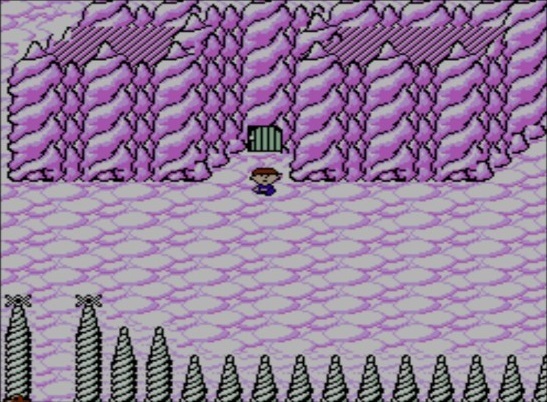 Some dungeons were simplified and condensed so it would be easier to traverse through them as the dungeons were long mazes in the Famicom original. There were a couple of additions put inside the game by the localization team. Earthbound Beginnings has a map. Having a map will show the current location of your party and all the towns and important landmarks in the game. The game also has a “run” feature. 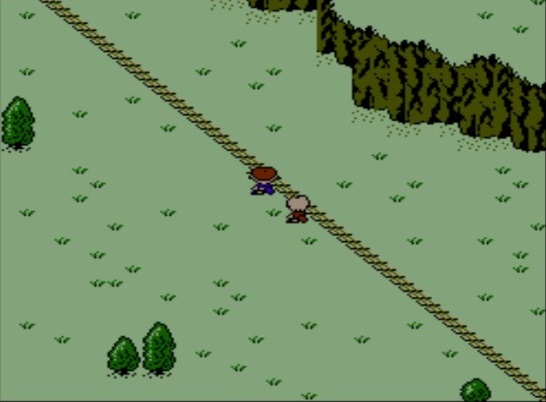 By pressing the B button, Ninten and his party can “run” through the map. Unfortunately, the “run” feature is bugged and only makes the game run in double speed. Because the game is running in double speed, it creates the illusion of running through the world map. The ending was extended and improved with new dialogue and scenes. Pirating is bad, support the official release. The toughest area in the entire game is Mt. Itoi. If you thought Death Mountain was hard, Mt. 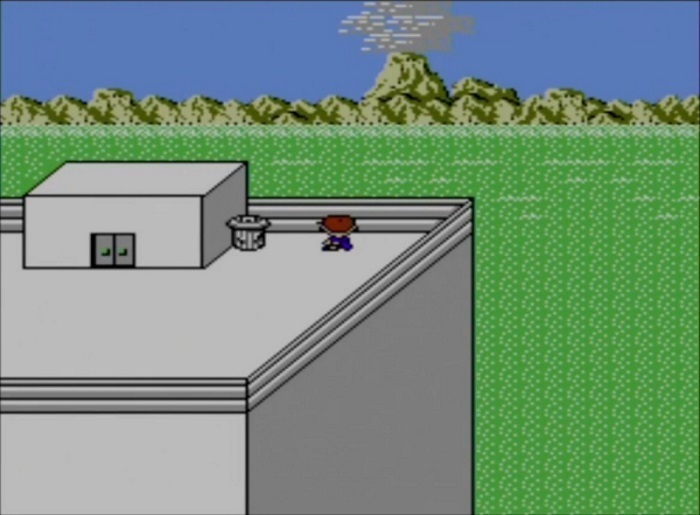 Itoi crushes it to rubble. The area is unfairly balanced with the hardest enemies in the game. They will literally destroy your party if they are not adequately leveled. This area nearly broke me, but in due time, I was able to survive the onslaught. Fortunately, one of Ninten’s PSI powers will help escape some battles, but he can’t abuse it the entire time. Shigesato Itoi once said in an interview Mt. Itoi was difficult because the development team ran out of time to test the difficulty as the game was rushed to completion so it could be released on time. It does not excuse the problems plaguing Mt. Itoi, but it does at least explain why the area is a hard, unexpected difficulty spike. 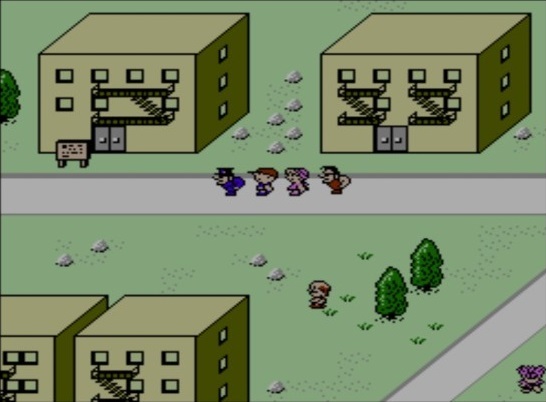 Earthbound Beginnings is a fun, old school RPG. The game has aged with some balancing issues and a few flaws which prevent it from becoming one of the best RPGs of the era. This game is not going to be for everyone and the difficulty will turn some people away. Earthbound Beginnings is like a historical artifact in the sense it was locked away in Nintendo of America’s vault for 26 years until the vault was open. It is great to finally have an official release in English for the first time ever and was worth the 26 year wait. While it would have been nice to see it released in physical form, I will take a digital release over never having an official release. No crying until the end. The review is based on the Wii U Virtual Console version. It took 10-12 hours to complete.